22-02-2000 OY-KKI SAS -Scandinavian Airlines, "Borgny Viking"
10-2004 after maintenance, put into service with fresh painting without any flags or titles, the only logo was SAS on tail, and the reg visible. 03-02-2005 OY-KKI SAS Braathens , "Borgny Viking"
01-07-2007 LN-RNN SAS Norge tfd, "Borgny Viking"
09-2008 LN-RNN decals changed to SAS Norge colours. 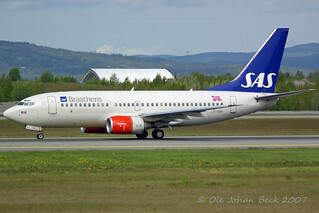 01-10-2009 LN-RNN SAS - Scandinavian Airlines returned, "Borgny Viking".